Why? i wouldnt mind if the same story was told in a slightly different way. no blatant retcon, but the same events seen from a different angle so to speak. I wouldn't mind retcons myself. I think it would be interesting of Ozai would be involved in Lu Ten's death. Exactly. I could tolerate retcons, since this is going to be a different story and so it doesn't have to have anything to do with the original. And if they could slot into the original without issue, like the idea of Ozai arranging for Lu Ten's death, so much the better. It's the best of both worlds; if the retcon works well, we can all headcanon it into the original, and if it doesn't, we can pretend M Nighty came up with it. We could then do a montage, pick the best bits of both versions and pretend not to understand when people ask why the series pops back and forth between animated, live action, and the odd sock puppet. 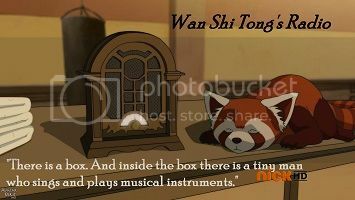 And put LoK's music on top of it all, just because. If they do the Ember Island Players episode, should they make references to the film? It would be funny for them to make fun of the “pebble dance” with several guys moving in sync and then just one rock slowly floats by. Team Avatar could lampshade how ridiculous said scene is. they'd have to make sure they really nail this series first. -And take a good course in "getting crap past the radar" to get away with insulting a Paramount/Nickelodeon production while using the same Paramount/Nickelodeon-licensed property. No, no, no, why waste more time on that monstrosity? Time to move on. We're going to do something new and different for EIP. Instead of a play, it should be an animated movie and the gAang should see it in a nickelodeon. And they should argue about whether it counts as anime. Okay, that last part might be a bit too meta. Every important cast member in that Nickelodeon will be going to war with one another. And while there at it; they can put in The Search. You know what? Make that the whole conflict. Sozin decides to spread revisionist history about it being an anime for some kind of personal gain and then Roku realizes the problems with this. As per canon, the entire war is started because of his failure to stop Sozin from perpetuating this nonsense. Oh, I almost forgot, the gAang initially has a hard time finding a theater showing the thing because most are spamming a documentary about local sea sponge life. You know what i want to see? Sokka singing on how the southern water tribe warriors are the best warriors of their world, and how they are constantly gaining victories against the fire nation. Maybe dedicate some songs towards Hakoda and Bato just like Roki! The Gang can be the chorus singers. Who knows maybe it will be done by the Ember Island players. And one in particular happens to be living in a pineapple and working at a mysterious underwater restaurant. Well I suppose I have a tad bit more respect for them, but it just confuses me more why they didn't try to bring as much of the staff back as well as sharing creative control for Korra (as I believe that any writers brought back were basically just hired guns to relieve them of work load) to the point of them even being able to provide feedback. In fairness yeah I can understand not wanting to wade through a lot of the more asinine fan comments to look for legit criticism. Heck while I stand by the specifics of my critique I will concede I let myself get out of hand in how I expressed my opinion/criticism. But then if they were truly open to feedback and not seeing critique as a harshing of their buzz, then there's no reason they couldn't hire professionals for imput on which ideas to can or modify. They actually talked about this in an interview with Nerdist back in 2014. The reason is: the movie. They felt so burned by the movie, that when it came to making Korra, they wanted as much direct control over it as they could have. They've never downplayed how important the entire production team was with ATLA - in the making-of documentary for ATLA, they talk about assembling a "crack team" of the best artists, writers, etc they could find. For Korra Book 1, they felt like they had learned enough from ATLA to attempt to write it on their own. Whether or not that decision paid off is of course a matter of debate, but that was the thought process that went into it. Given how the movie turned out, I think it's understandable that they felt the need to be protective of their creation. This was when they only thought of Korra as a mini-series. Once it was expanded into a multi-season show, they knew they needed to bring more people into the production, both with writing and directing. Is this the interview? I'm not going to be in a position to listen to an 1.5 hour interview for a few days, but I'd be interested in hearing that kind of thing. Well, that alone has me more interested in this whole Live Action Series thing just to see them make good on that desire. Maybe the franchise isn't in as dire a situation as I thought, and we might get something new after this, after they avenge themselves. I don't know where to post this exactly, so I decided to post it here because it includes little bit about the future. Maybe post it on the front page too? A 37min Interview with Jeremy Zuckerman (you can increase speed to save time ). Description: "In this episode of The Mutuals Interviews, Ben Rolph talks to Jeremy Zuckerman who composed the score for ‘Legend of Korra’ and ‘Avatar The Last Airbender’. He will also compose the score for Netflix’s live-action ‘Avatar The Last Airbender’ series." Speaking of the music, I am very curious how much of the new score will be synthesized, versus using real instruments. For certain instruments, there's a noticeable difference in the sound, and both AtLA and LoK made use of real instruments for special stuff. I wonder if the Netflix budget will allow for that to continue, or if it will all go synth. As long as the beautiful made up instrument that is the Tsungi Horn is included. Frankly whether I can back up the claim that Bryke are cynics, I guess the final thing I can say on the matter here is that I'd feel more hopeful about something coming from them if they'd admit to being imperfect. Credit where it's due I have a bit of respect I guess that they do share credit for the success of ATLA, but I'm talking about admitting that some of TLoK's shortcomings are just as much their fault as much as it could be with Nick or fans for not conforming to their mindset. Actually admitting that even if they stand by their ideas that they did execute them poorly. Cause frankly it's impossible to improve unless you can admit that improvement is needed. I don't think Mike and Bryan ever pretend that Legend of Korra is somehow perfect. It's the show they wanted to make, and they're not going to apologize for that, but that's not the same thing as acting like it's perfect. It's presumptive of you to say they need to "admit" their shortcomings when they likely don't agree with you on those specific shortcomings to begin with. Responding to this post in a PM and I suggest any one else who disagrees with my post takes it to PM as well.